This Apartment Is Too Small: Let's get organized! I recently re-discovered one of my favorite things: Real Simple Magazine. Honest to goodness advice and tips that help make your life easier, what could be better than that?! Every time I open one up, I think "Wow, how did I not think of this super easy idea that makes chores/cooking/organizing easier?" What's even better then Real Simple Magazine though? When a friend emails you tips and you don't have to go out and buy the magazine in the store - free advice is that much more fun! I love me a set of clean sheets. I don't know what I was thinking in college, but I would go a month without changing my sheets. Now, after only a few days it just feels like those microscopic bugs that live on everything are crawling all over you. Ugh. Time for a new set of clean sheets! However, we don't have space in our closet to store the 3 sets we have, so they end up on a shelving unit that lives in the middle of our bedroom. 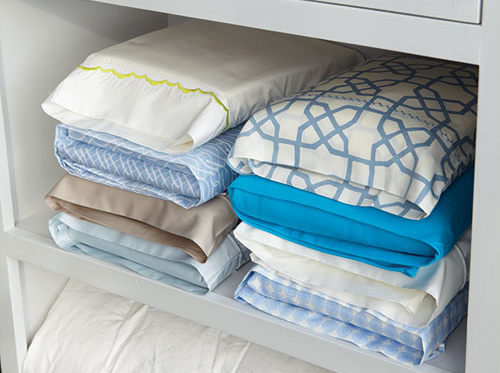 Low and behold, new useful tip #187 is to store a full sheet set and extra pillow case INSIDE the matching pillow case and you will never go hunting for the complete sheet set again. BRILLIANT! Clean sheets all folded nicely and stacked like the above picture are sure to help save space and show off how organized you are. Ok, now this tip is extremely helpful for limited cabinet space - buy a tension rod and use it to store all your cleaning sprays above your other cleaning supplies. 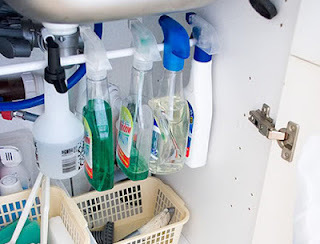 This tip is particularly helpful if you love cleaning supplies (me) and hate how cluttered and unorganized they can get (me). I realized the other day that I have three bottles of Scrubbing Bubbles Shower Foam and they are all 3/4 full. I suppose my weekly trip to Duane Reade for shower cleaner can be cancelled this week. 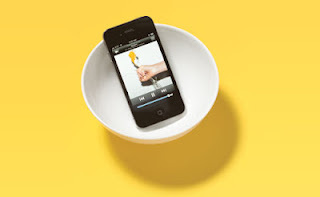 This has nothing to do with organizing, but I thought it was a great simple way to get the music flowing - use a bowl to enhance the Iphone/Ipod/Android speakers instead of using plug-in speakers. In all honesty I don't think bowl acoustics can match a $600 Bose Speaker System, however, in a pinch this can pretty much ensure an instant dance party after a few drinks. **or get stolen by your cat to be used as a pretend mouse and end up under the dresser that you don't find until you are moving and exclaim "That's where all my tiny owl figurines went!"